Do you clean out your children's bath toys? Did you realize they harbor mold which can give your child rashes - and well, it's just gross and nasty! You will probably need to use bleach to clean them out and toss the real nasty ones. 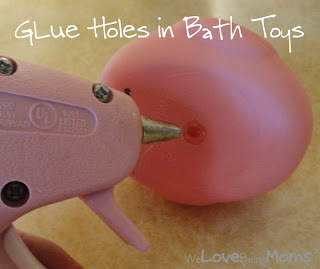 But I love this tip - just glue up the hole with a glue gun... and no more mold! NOTE: If your child is the type to be able to remove the glue and eat it, this might not be the tip for you. Since the glue goes inside, I am not sure how they could do this, but I know some kids seem to do the impossible! REMEMBER: Little children should always be supervised while in the bathtub, so do keep watch on the toys for removed glue. Amy Merrell posted: Good idea, except if you stop up the holes they can't squirt them anymore. The squirting is what my kids like about their bath toys. I just clean them out good with bleach water from time to time. The nasty ones get tossed. Erin Tucker posted: Why didn't I think of this!?!?!?! We've thrown away tons of bath toys and have a hard time finding new ones because they all have that hole and get moldy. Whoo hoo! Jennifer Krane posted: I throw mine in the dishwasher every now and then. If they can't take the heat - then I throw them out. I always need a quick fix because they take a bath almost every night. Jessica Glendon posted: Jennifer... be careful... dish-washing soap is one of the most caustic substances in our homes... so if any residual soap is getting stuck inside, that could be doing your children as much/more damage. Just FYI. Lourena Little posted: I wouldn't buy toys with holes in them, that would solve the problem.